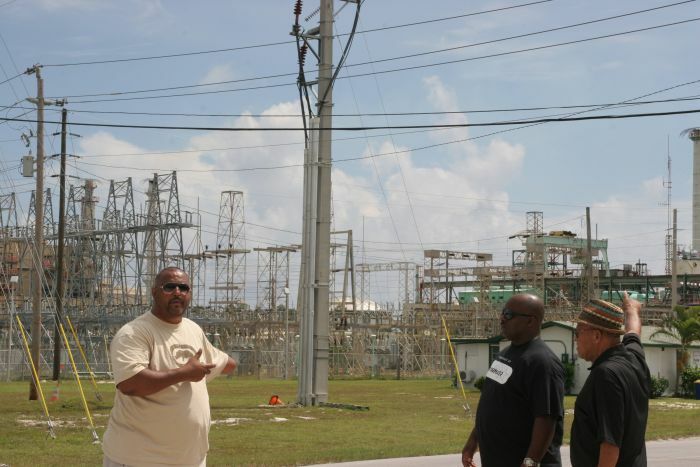 Troy Garvey, Jonathan Glinton and Etienne Farquharson stand in front of the old Grand Bahama Power Station. Critics say the old plant could have been retrofitted for a fraction of the $80 million Emera recently spent on building a new power station, where allegations of union busting are rampant (Miles Howe photo). FREEPORT (GRAND BAHAMA)—Just as Nova Scotians are now bearing witness to the multi-billion dollar Muskrat Falls deal, in which final costs for both power and construction remain vague and unknown, so too do residents of Grand Bahama suffer at the hands of Emera's plotting and guaranteed rates of return to shareholders. 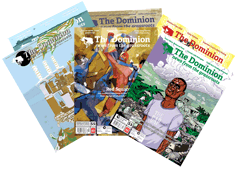 And just as Nova Scotia Power executives now keep vital documents from the public they service — for fear of self-harm to reputation no less — so too are residents of Grand Bahama kept in the dark as to the actual breakdown of their power bills. Just shut up and pay seems to be the Emera way. The Grand Bahama Power Company, Emera's monopoly service provider to just under 20,000 souls on the island of Grand Bahama (population approximately 60,000), charges a little over 40 cents per kilowatt hour of power. This rate is about 320% the average rate charged in Fort Lauderdale-Miami (around 80 kilometres away). Over 50% of this 40 cent per kilowatt hour charge is mysteriously buried into something called a "fuel surcharge." That this fuel surcharge does not correlate to any actual fluctuations in global fuel costs is the first indicator that something is wrong with Emera's calculations. This lack of clarity is not aided by the fact that Emera is unable and/or unwilling to explain by what means they have calculated this fuel surcharge. Nor is it aided by allegations that Sarah MacDonald, president and CEO of the Grand Bahama Power Company, has been touting the idea that the Grand Bahama Power Company will be turning dividends for Emera shareholders in under three years' time. Critics on Grand Bahama suspect that MacDonald is amortizing costs related to many other things other than fuel surcharges into the mysterious "fuel surcharge," and is thus crippling the industrial and population base of the island. Emera's recent construction of an $80 million diesel plant, known as West Sunrise, where allegations of union busting are now running rampant, is one of the suspected costs now being buried in the so-called "fuel surcharge." Unemployment on Grand Bahama has skyrocketed to over 21% as of November 2011 — up from 15% as of March 2011 — and is well above the national average. Grand Bahama, like some tropical equivalent of Cape Breton, is also subject to a dwindling population, as the able-bodied seek out employment in the capital of Nassau and abroad. Knowing this does not, however, answer the question of what exactly Emera is doing in Grand Bahama. As we see with the intricacies of Muskrat Falls, where Nova Scotians stand to play the dupe, and foot the bill, for Emera's designs on American power demands, the multi-national power company doesn't do much without a grander plan in mind. With a limited customer base of under 20,000, the island of Grand Bahama seems a tad small for Emera's tastes. It is perhaps 215 kilometres to the south, to the metropolis of Nassau (population over 250,000), to which Emera has set its sights. Critics note that Emera has already made overtures to the former Bahamian Free National Movement government towards purchasing the Bahamas Electricity Corporation (BEC), the nationalized service provider. It is alleged that their initial offerings were rebuffed by the former majority party when it was disclosed that Emera was interested in breaking up the national service provider in order to get its hands on the metropolitan Nassau component of the corporation. As it is, the BEC serves sparsely populated islands separated by vast bodies of Atlantic Ocean and is not a money-maker. The highly-concentrated population of Nassau would be the only true jewel in the BEC crown. On Grand Bahama, with Emera's recent construction of "West Sunrise” one sees a situation in which the current Progressive Liberal Party (PLP) has known of allegations of union busting at West Sunrise since May 22 and has not acted upon them. 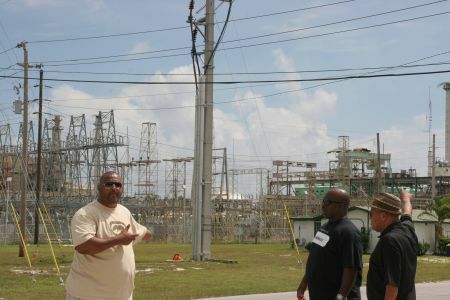 In a letter sent to the ministers of labour, tourism and Grand Bahama, Commonwealth Electrical Workers Union (CEWU) president Leslie Lightbourne outlined in detail the ways and means by which Emera was breaking the existing collective bargaining agreement between his union and the power company. In early August, Dr. Michael Darville, the Minister of Grand Bahama, told the Halifax Media Co-op that he was aware of the letter, but suggested that some members of the CEWU had mentioned that Lightbourne was not the strong union president they needed. The relevancy of Lightbourne's "strength," in relation to the dire straits his union is now facing, in light of the current government's inaction towards the plight of the CEWU, is not known. It is troubling indeed, however, and suggests a political climate in which Emera has now gained a hotline to the ear of the PLP, which campaigned strongly against exorbitant power bill increases on Grand Bahama leading up to its landslide political victory earlier this year. Grand Bahama, where duty-free fuel circulates in massive quantities, and where monopolies control licencing, the international port, fuel delivery and the power company, is the perfect launching pad towards the lucrative Nassau market. Developments on this situation, as well as with the variety of court battles that Emera is now involved in on Grand Bahama, should be watched with interest.